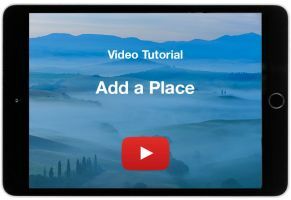 The easiest way to learn everything about Places2Note and how to use it is by watching our video tutorials. So just relax and let us walk you through the software. If you require further support, please contact our support team. We look forward to hearing from you. 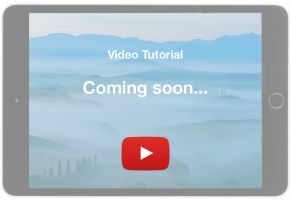 This video will walk you through the main features of Places2Note and gives you an overview of the main functionality. For more detailed "How to? ", please watch the following tutorials. This video shows you how to add a place using the integrated GPS or any location on the map using the cross hairs. Learn how to select a category, define a place name, add rating, comment and media files. This video demonstrates how to edit a place at any later stage, e.g. to move it to a new location, change its name or rating, amend a comment or attach new media files. In this video will show how to search for places in your own database, use the list view and search for worldwide place names. This video walks you through the world of maps supported by Places2Note. Learn how to change your background map and how to use various overlay maps to enhance your mapping experience. This video demonstrates how to download map tiles for offline use. This is an interesting feature if you're planning to go hiking where there is no cellphone coverage or to travel abroad and you want to avoid cellular roaming charges. This video explains the use of tags as an easy way to filter your places. Learn how to create and to delete tags and how to use them for filtering. This video demonstrates how to share places on your Facebook wall. In this video we will show you how to manage your friends, create groups and share places with them. We explain how to use the newsfeed notification to add shared places to your personal database. This video guides you step by step through uploading tracks as GPX files, showing them on the map, customizing their appearance, and sharing them with friends or creating PDF maps. This video demonstrates how to create a PDF of your map. This is useful if you want to take a printed map on your trip. * This feature is currently available only on macOS. In this video you will see how to enter map coordinates to precisely position your map and add places at known coordinates. You will also learn how to change your coordinate settings. Learn how to export your (filtered) places to Google Earth or similar applications using KML file format. In this video we will show you how to customize Places2Note by creating personal categories for your places.